It's important for PJs to know how to write well. Not simply good enough for a story to see ink, but good enough to get and keep readers' attention. It's a skill like lighting or developing film. It can and should be learned by all PJs. Sometimes a PJ is the only person who has access to the story subjects (in foreign countries). Occasionally, the PJ is the only person who's initially motivated to get a story to print (great shots – no reporter available). PJs at smaller newspapers tend to write more stories. PJs at larger papers are surrounded by great reporters who live for big stories. However, a rare major story can still land on the PJ like a boulder. If PJs don't know where to start, they're in trouble. For freelancers, writing is a critical skill. Several magazines ONLY accept story packages (photos and text). If PJs can write, they earn more money and make wiser use of their time. I suggest most PJs should take a Journalism (J-102) course at a community college or university. J-101 is typically "mass media" and is nice to know, but it doesn't get into the mechanics of writing as quickly as J-102. Otherwise, PJs should at least get an introduction to reporting book and read it while working toward a PJ job. Then, read. Read newspapers to learn style and brevity. Critically analyze each story as one would a photo. Pick it apart to understand its lede (the beginning), structure, use of quotations, transitions and pace. Next, ask questions. See the list below. PJs can also do this with a magazine. I've found stories written in a newspaper format can easily adjust to a magazine, but the opposite does not hold true. In either case, keep it simple and sharp. PJs want the story to be understood by most people. Again, this isn't dummying down. It's good, tight writing. When I was in college, I was the news editor and later the editor/semi-publisher of the independent campus newspaper. It taught me never to want to be an editor again. At a college newspaper, most reporter applicants were journalism students and understood basic grammar, AP style, as well as reporting and editing techniques. However some had obviously never read a single newspaper. Nonetheless, it takes more college reporters to fill a newspaper than professional reporters because the writing and editing process takes much longer for new reporters. Consequently, I needed a plan to save myself editing stress and get stories to the press quicker. So I came up with the following checklist. There should be some items added, and I've already deleted one item because the style books have changed. But for most PJs, this should be an adequate checklist before turning in a story. * Have these answers been provided? Active: He hit the ball. Passive: The ball was hit by him. * Does it make sense? * Does it have a quotation? – It shouldn't. * Does it ask a question? – It shouldn't. * Are there five sources? * Is at least one of the sources a student (or local resident)? * Is there a conflict? * Are the characters revealed? * Are the quotations legitimate? * Has the writer removed herself/himself from the story? * Is all jargon defined? * Is the story objective? * Have both sides of the conflict had a voice? * Is the story grammatically correct? * Is each prepositional phrase necessary? * Is every word necessary? * Have all the questions been answered for the reader? * Has the story been spell-checked? * Is the story written in AP style? * In news stories particularly, the writing should evoke exclamation points. Therefore, remove exclamation points. * The word "said" may be used throughout the entire story. Don't worry about repetition because "said" will be ignored by the reader. For written documents, use "states." Characters in compositions (plays, books, poems, etc.) "say" because they will always say the same thing to each reader. * Be specific and use common language. * Be aware of the reader. If the average reader can't understand the story, the writer failed most readers. * Quotations move the story, not stop it. * Transitions move the reader through the story. * Read the story aloud. Listen for odd phrases or rough areas. Then, fix them. * If a sentence can't be read aloud on one breath, break it down. * Finally, is this story better than your last one? Why/why not? 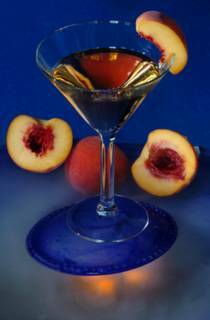 The Dragonfly at Hotel ZaZa offers a Dreamy Martini at the hotel in Dallas on Wednesday, September 29, 2004. I enjoy these "Drink of the Week" assignments because I get to arrange shapes and colors. As a bonus, it's a low-stress assignment; if something goes wrong, I can shoot it again. I had already gotten some cool images of beach balls spinning under a waterfall in the Jacuzzi as my background and wanted to try a different background. I was moving my beast strobes to work the repetitive shapes of the hotel facade when the couple in the background came out to sun themselves. It looked really cool while I made some final light tests. However, as soon as I got behind the camera, the guy sat up. I fiddled around for about 15 minutes hoping he would lie back down, but he didn't. Since I had to split for another assignment, I worked with what I had. The original idea was OK. Then it got great, then it disappointed me. It's still better than the original idea (because it has some life in the image), but it could have been so much better. Darn it. I often wait for random actions in the background (or foreground) of my images. Most of the time it works. This is one of the ethical differences between PJ and advertising (commercial) photographers. With PJ, whatever random actions happen -- happen. With advertising, they would have hired models for the background and told them how to act and what to do. An ad photographer would have probably put an extra couple in the top, right-hand balcony as well. They would also have model and property releases as well as a hefty check at the end of the shoot. Fayrouz, my wife, celebrates her birthday today (September 24). I'd like to make her birthday special this year by letting her know she's loved. Andrew Batt, chief photographer at The Wokingham Times series in the UK, asked a question in the comments section of the last swimming photo. He asked about getting subject's names in America (as opposed to UK policies). Because it's an important question, I'm answering here rather than having it lost in a comment section below. If a person isn't identified (named), it probably won't run at most American newspapers. IF we get someone committing murder, then it's a different deal. 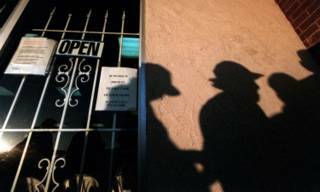 However, any image can run as an "unnamed person" in the cutline under our byline name (called a "credit line"). I don't want this because it means I failed our readers. Because most publishers are strict about names and spellings, PJs fight extra hard to get names so the image can run. Otherwise, we're wasting time. With children, I normally ask the child to point out a parent or guardian. They know the child's name (spelled correctly). If they have a problem with giving out the child's name, there's always another cute kid somewhere who would love to be in the newspaper. I don't appreciate it when PJs deny people the right to have their name in the news. People like to be in newspapers, magazines or on TV. They also tend to like their names. By denying a person the honor of asking their name, it's akin to saying their name is insignificant. It's an honor to get into the newspaper. Not everyone can do it. I want people to know they won't die unobserved. Each person is important and deserves to have their name known. If they turn down this honor, it's their choice. Not mine. Normally, it's all in how the subject is approached to get names. If the PJ smiles a lot and explains who s/he is and why s/he shot, the subjects normally give their names. Here is exactly what I say to people as I directly approach them with pencil and paper, "Hi. 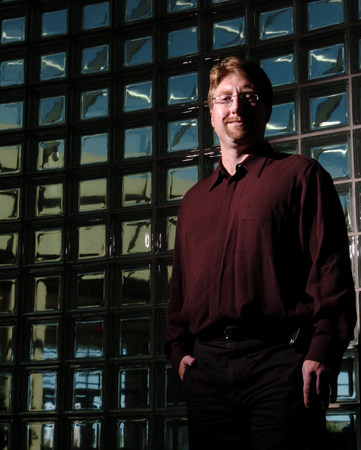 I'm Mark Hancock, and I work for The Dallas Morning News. I made a photo of you a moment ago while you were (doing something), and I need your name please." This statement answers most questions and doesn't give them much room to escape. I've given them my name. Common courtesy is for them to give me their name. I've let them know for whom I work (a big, legitimate newspaper), and de facto why I made the image. I let them know the image is already done. At this point, they would need to turn back time to make it disappear. Then, I cap it off with a polite "please," smile again and put my pencil on the paper. I show them what I've written so they can see I spelled their name correctly, and we're both good. Meanwhile, other people have seen what I've done, and they can drop their guard a bit. They know I'm working and doing my job. I'm not harming anyone or doing anything bad or unusual. Just letting people have a chance to shine. Maybe they'll get to cut out a piece of paper to stick to their refrigerator for a while. Although it wasn't specifically asked, I'll address another issue with getting names. People want the PJ to commit that the image will run. We don't know. We don't make the final decision. If a PJ says, "This will run," there's potentially a huge problem. What if it doesn't? Then the PJ is a liar. Instead, say it "could" or "might" run, but let the subject know the PJ isn't the publisher and doesn't make the final decision. Story of the Year performs at Nokia Theatre in Grand Prairie on Wednesday, September 22, 2004. This was a tough shoot. The crowd surfers continuously dropped into the shooting pit (and fatally wounded the D2H I was using), the lights were absolutely insane and the performers were in perpetual motion. I gave up on auto everything and had to shoot fully manual. There were scanning spotlights from behind and dim lights to the front. It made auto focus and exposure useless. I walked it down to 1/60th at f/2.8 and every third frame(at 3 frames per second) had a reasonable exposure, but most had subject blur. The band came on stage at 10:01 p.m. in Tarrant county and deadline was at 10:40 p.m. in Dallas county. There was no way to Wi-Fi the images. I had to drive it back to the main office. I was a little late, but it made the paper. Such is life at a daily newspaper. I’ve started a blog for photographic terms, formulas and important PJ personality biographies. It’s called PJ Glossary and is located on the sidebar under “Family Links.” At the moment it’s in its infancy, but it’ll start filling soon. In future entries (and back filling as I have time), I’ll link to key words located on the other blog to fill in the informational gaps with accurate definitions. If anyone has a suggested key word, definition, formula or bio, drop me an e-mail or leave a comment. Eddie Adams was born in New Kensington, Pa. on June 12, 1933. He died today (September 20, 2004) at his Manhattan home from complications of Lou Gehrig's disease (amyotrophic lateral sclerosis). He was 71. During his life, he covered 13 wars. He was known as a combat photojournalist whose images changed the course of history. He won the 1969 Pulitzer Prize for breaking news with a photo of a Vietnamese officer executing a communist guerrilla in Saigon during the Vietnam War. In the fast-action image, the bullet was still contained within the guerrilla’s head. He also earned more than 500 other honors during his career. Among those awards were a 1978 Robert Capa Award and three George Polk Memorial Awards for war coverage. He created images for The Associated Press (AP), Time, Life, Newsweek, Vanity Fair, Parade and countless other publications. In addition to photojournalism, he shot for clients in fashion, entertainment, advertising and corporate industries. 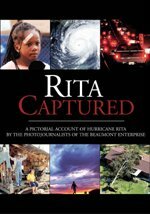 He started the annual Eddie Adams Workshop (known as Barnstorm) held in Jeffersonville, N.Y. in 1988 to train aspiring photojournalist. His books include: "Beyond Glory: Medal of Honor Heroes in Their Own Words ", "NYC Life Going On ", "Let Freedom Ring: A Pictorial Celebration " and participation in several "Day in the Life" book series projects. His images can be seen at photonews.net and Shutterbug, among other places. Before anyone decides to shoot a wedding without theft insurance, read this story. The folks across the parking lot report wedding photographers are having equipment stolen during top jobs. The problem isn't just equipment; the thieves are taking the (irreplaceable) film/disks at the same time. So, if weddings weren't stressful enough on the PJ, add this issue to the price of the next bid. Throughout this entry, I refer to potential "clients." It's meant to imply both freelance clients and staff employers. Substitute as necessary to reflect your personal goals. A portfolio is a set of select images chosen to highlight a PJ's technical and aesthetic abilities. Everyone has different opinions regarding portfolios. Since each photographer and potential client is different, there's no one-size-fits-all answer to preparing a portfolio. However, there are some general guidelines PJs can use to favorably present their portfolios. PJs need to consider which clients they want as well as the needs of these potential clients. Then, PJs must deliver appropriate images. 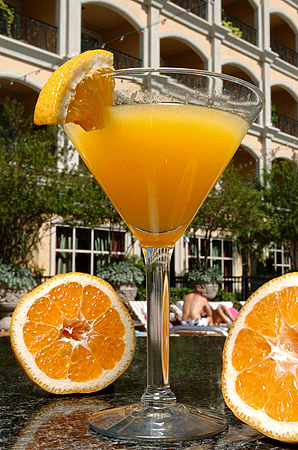 All images must be compelling examples of the PJs' abilities to meet clients' needs. Additionally, image presentation is important. The presentation should be professional and persuasive. Portfolios – and subcategories – must start and finish with the strongest images to leave a positive lasting impression with the viewer. When the client has already seen thousands of images, the PJ wants the clients to close their eyes and remember her/his images. There is only one chance at this lasting impression. Likewise, each weak image has an equal chance of destroying the overall opinion of the editor. Because PJs are visual chameleons, clients can vary widely. Typical clients are newspapers, magazines, book publishers, record companies, trade publications, travel markets, galleries, and other business clients. These markets are interested in the PJ's work as documents of reality. They all rely heavily on striking portraiture as well. In all of these markets, the PJ is specifically hired to make story-telling images. Although advertising, greeting card, catalog, stock companies and design firms use photographs, those markets are considered commercial and require a different code of ethics and business structure. They're not forbidden, but they're less cooperative to PJ goals and could cause conflicts of interests. What clients do PJs want? Flexible, frequent and well-financed clients are best for PJs. Clients who give PJs flexibility of time, artistic design and even subject matter are great. However, it's important for the PJ to keep working behind the camera. The clients who give frequent assignments are preferred. It's also critical to make a living with competitive fees. The client who can provide all three is best for professional PJs. Most PJs prefer to shoot a wide range of subjects. Although other photographers may specialize in a niche, PJs tend to prefer the challenge of changing gears from assignment to assignment. Clients should be chosen wisely to ensure the PJ gets a good mix of subjects to face intellectual challenges as well as expand upon the PJ's technical base. Meanwhile, a series of one-time clients makes the PJ work harder to get assignments rather than make images. Many PJs are work driven (rather than business driven). Therefore clients who use many images and make multiple assignments have an advantage over other clients. It becomes a symbiotic relationship where the client needs many images and the PJ needs multiple assignments so both can continue to meet their goals. Although this entry isn't directly about income, PJs don't benefit from flexible, frequent assignments if PJs lose money at the end. Although there are many worthy causes which offer desirable work for PJs, remember the rent is due on the same day every month and each equipment use is one step closer to a repair. Pursue clients who understand this. PJs know what they like and hate to shoot. Different PJs can't stand to shoot sports, entertainment, breaking news, portraits, photo essays, food, fete sets, mug shots or any number of subjects. The PJ must address these dislikes or be doomed to unhappiness (and potentially poverty). PJs do their best work on subjects to which they hold a passion. This inevitably leads to more assignments with similar subjects. It creates a positive, upward spiral for the PJ and the client. The opposite holds true as well. Research is the first step in direct portfolio presentations. Know the chosen market and specific outlets within the market. Understand exactly what images the clients use and why they use those images. If the PJ were hiring a PJ, what would s/he expect and demand from an applicant. Once this step has been taken, it can be reversed and the PJ should include or exclude portfolio images which don't fit this ideal. A farm and ranch magazine has little use for images from a Parisian fashion show. It wastes everyone's time to include wrong images in a direct portfolio presentation. Ask questions about the images chosen for the publication. Are these stock images? Are these handouts from tourism bureaus? Was it staff produced or freelance? Who was the PJ? How much does this particular PJ normally charge? The list of questions can go onward. A simple online search for the same images elsewhere may answer many questions. The important point is to understand how the client finally decided which images best suits the publication's style or "brand." It's often disappointing to find the upscale magazine's style is actually "cheap" (as in all handout photos). An online portfolio is typically a generic portfolio. It's constructed to interest the widest possible set of image buyers and quickly steer them toward appropriate images. PJs want to show their abilities to focus, properly expose for the desired effect, gain access, work with subjects (portraits), use light, make good compositions, handle fast action and handle difficult assignments. Basically it shows everything PJs know about photography in 10 to 20 frames. As PJs build libraries of premium images, they may choose to separate images by category. This steers potential clients toward images to which they'll relate. Ten frames per category is a good goal for divided online portfolios. Again, remember not to pad categories with inferior examples. If a PJ only has three great sports images, then only include those three images. More great images can be made in time. Be patient and don't lose potential clients. An online portfolio is a point of reference. PJs refer clients to Web sites to see examples. The online portfolio by itself seldom gets a job for a PJ. It's simply an efficient way to present a PJ's portfolio to multiple clients simultaneously. Anyone who expects otherwise is heading toward disappointment. If a PJ doesn't know how or doesn't have the time to create an online portfolio, Fayrouz and other Web designers are always ready to help for a fee. Direct portfolios typically take the form of 20 slides in a protective sleeve or a 20 image CD. It's mailed to a specific client for a specific job. As noted above, it must be researched and tailored for the client. This approach is most likely to result in work. It places the portfolio directly into the hands of the person who makes decisions. Each direct portfolio is accompanied with a cover letter and a Self-Addressed Stamped Envelope (SASE). The SASE is critical. It must have proper postage and be large enough to get the portfolio returned safely. Some PJs also choose to include a resume, client list and/or stock list (depending on client). When submitting CD portfolios, it's most logical to ask the editor to retain the CD on file for future assignments and use the SASE for a reply or guidelines. Print © and your name along with a Web site address on the CD. Let the editor know additional images are available for review on the Web. This approach allows PJs to update Web site images and contact information as better images are acquired or contact numbers change. A slide portfolio is more likely to be reviewed. The editor opens the envelope and can immediately hold it to a light and evaluate its worth. If it's good, s/he may put it on a light box or take it to a light table for a detailed examination. Never send original slides. Instead, send duplicate slides (dupes). Always mark the slides with a © symbol and the PJ's full name and Web site and/or e-mail address. Use premium foil-backed slide labels to ensure they remain attached to the slide mount. Slide portfolios require a cutline sheet corresponding to the images by number or some other logical means. Don't assume the images will remain in the sleeve in the correct order. They can drop out in the mail or be rearranged by anyone who handles them. Slide portfolios tend to be much more expensive than CD portfolios. Consequently, PJs are more likely to request a review and return of the portfolio. This is fine for internships and staff applications. However, the approach is counter-productive for freelance work unless the PJ includes a leave-behind brochure, calendar or other desk gadget to remind the editor about the PJ's work and availability. Of course leave-behind products add expenses to the PJ's marketing costs, but the cost may pay off with a future gig. A CD portfolio requires the reviewer to insert an unknown disk into a critical use computer. This requires the editor to take a leap of faith that the disk contains no viruses or spyware. The cover letter must compel the editor to take this chance or s/he won't. Furthermore, the CD must include everything the editor needs to preview the images. A PJ can't assume the photo editor is using a Mac computer or even knows how to access raw files. The CD must be formatted for use in both Mac and Windows environments. Ideally, the CD includes a HTML coded viewer. The editor can launch the viewer and see the images and cutlines in the order designated by the PJ. This approach provides a real-time viewing experience for the editor as there is no additional Internet download time involved. Again, if a PJ doesn't know how or doesn't have the time to create one, Fayrouz also offers this specific service for photographers and other designers are also ready to help for a fee. When hiring a designer for CD portfolio presentations, make sure the jobs are worth the presentation cost. Additionally, make certain the images and cutlines are absolutely top-notch and the portfolio is suitable for multiple clients. Unlike self-produced CDs, designed CDs must cast a broader net with images to catch more clients. In all cases, test the final CD on different computers and browser platforms (Mac/PC, Explorer/Netscape/Safari/FireFox). If it doesn't look perfect on all, keep adjusting and tinkering until it does. Many PJs have Flash presentation portfolios. It allows the PJ more control over the presentation of the images. It also assists in online copyright protection. However some flash presentations are sequential and don't allow the viewer to stop and move backward through the images. This can frustrate and lose some potential clients. Additionally, the presentation depends on the willingness of the editor to install Flash reader software on a computer. Not only does the program occupy valuable disk space, it may be against company policy to install any non-approved software on company machines. This could lead to a quick return (or trashing) of an unseen portfolio. When presenting a slideshow during a lecture, it's cool to have images timed to music. It creates a total viewing experience. However, the editor doesn't need a metal band (or even Bach) to suddenly start blasting in the middle of a busy newsroom. Embarrassing an editor is a first impression best avoided. Additionally, the PJ wants the editor to focus on the images – not who's singing the song or some childhood memory. It's mentally exhausting to critically analyze images. Don't make it harder on the editor needlessly. If above wasn't a good enough reason, consider the copyright on the music. Music and photos are protected by the same copyright laws. If a PJ willingly violates copyright, what would the editor think about a PJ's ethical code or the veracity of the images? Although I've listed reasons not to include music with a CD (or online) portfolio, some folks (musician-photographers) insist. In such cases, use royalty-free music or purchase presentation rights. This also adds an additional layer of research to the presentation. The PJ must absolutely know the musical preferences of different editors. Selecting wrong music does more damage than a single wrong image could ever accomplish. Present images you enjoyed making to a client. It's OK to have challenging and technically superior images in a portfolio. Because the portfolio is an immediate representation of the photographer, it can be creative, colorful and thought provoking. These are the qualities a client seeks in a PJ. Don't include real estate photos, mug shots or anything else someone with a point-and-shoot could have done. It's insulting to the editor, and degrades your work. This is where nuance enters. Although I suggest tailoring the portfolio to the client, I don't mean mimic or mock the client. Because the client has a real estate section in the publication, it doesn't mean those images are taken by staff PJs. Along these same lines, if a publication has dreadfully boring images, don't send a dreadfully boring portfolio. Nobody wants to eat their own vomit. The publication may be planning to head in a new direction or had a management change and they're looking for PJs who are already there. BTW, why are you applying to a publication with dreadfully boring images anyway? It's probably a waste of time and investments. The PJ wants her/his portfolio to rise to the top of the box (yes, they literally have a huge box of fine portfolios). When all applicants have equal images, equal credentials, equal awards, how does the editor choose who gets the job? Presentation. Again, PJs put themselves in the shoes of the editor. These PJs present a professional portfolio with a classy flourish or a slight quirk. There is a fine line between over-the-top and really cool. If a PJ isn't certain of the line, go for strictly professional. Doug Davis, one of the most successful commercial photographers I know, has hand-buffed steel business cards with his name and phone number pressed (like military dog tags). Clients immediately know he's edgy. It makes a good first impression, especially when it's presented casually. The clients are also far less likely to toss it in the trash after he's gone. The point is to display in the portfolio presentation additional qualities of the PJ. A quickly hand-scrawled cover letter to "Whoever hires photographers" tells an editor a lot about the PJ. Most of it isn't good. Likewise, a well-organized portfolio with meticulous attention to each detail also tells an editor about a PJ. Although every PJ has probably been required to make figure studies in college or make images of horrendous carnage while working, don't include the most graphic images in the portfolio. Even if the story is about tribal customs around the world, I'm certain the assignment can be accomplished in less offensive ways. When choosing the final cut for an initial portfolio, ask yourself if your grandmother or 10-year-old niece would be shocked or profoundly disturbed by any of the images. If she would, leave it out. This is particularly important with online portfolios. The PJ's goal is to be well placed on search engines to draw potential clients. If the PJ includes images (or even some links) which appeal to "prurient interests," the Web site could be filtered out of the broader market. This is not dummying down the portfolio. It's simply not pandering. Having given the warning above, there are rare social issues which should be addressed directly. These issues may offend many because sensitive people don't particularly want to face the misdeeds of mankind. Photo editors can discern the difference. The general public may not be able to do so. If these rare images are DARN good, they can be included in professional direct-marketed portfolios (after proper research). However, I'd still avoid placing them online. 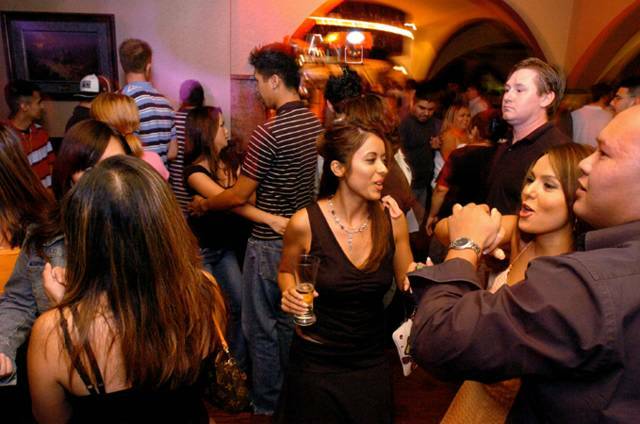 Cynthia Ramirez (center) holds a beer and dances with friends at Chaucer's at Mockingbird Station in Dallas on Saturday, September 18, 2004. The upscale steak and sushi restaurant converts into a late-night lounge with a disc jockey for the SMU-ish crowd on weekends. Down Bar and Lounge offers a Peach Martini at the lounge in downtown Dallas on Wednesday, September 15, 2004. I still like this image, but I'm posting it as a mistake example. This mistake could have easily been fixed in Photo Shop, but moving pixels is unethical, so I'm stuck with my mistake. It ran small, so I doubt anyone noticed. It's nothing to wake me at night, but it's like a fish that got off the hook. It's a "dagnabit" moment. I used napkins to hold the peaches in position. From a 200mm angle, the napkin behind the peach half on the right wasn't visible. However, when I switched to a 50mm and moved closer, it showed up. I was worried about balancing everything in place (the glass had already slipped once). Simply stated, I got sloppy and didn't notice it at the time. This wasn't one of my selected images (because of the napkin), but the editor preferred this angle/lens/light combination. So, this is an example of the importance of paying attention to the smallest details - even when there are bigger issues. Eventually, someone else will choose an image a PJ may not prefer. The PJ's mistake has his/her name attached to it, and the PJ must live with it. We try to learn from our mistakes. In this case, everyone can learn from my mistake. In realistic terms, it's still simplified to money. At the end of the year, the amateur spent money on photography and the professional made money. I'd hope advanced amateur PJs want to AT LEAST break even at the end of the year (this includes college students who have high, start-up costs and overhead). Otherwise, they’re heading toward a short career or an expensive hobby. In absolute terms, the difference is also money. When doing taxes, anyone who claims photography-related income and expenses is a professional because the expenses aren't a write-off for hobbyists. I plan to address PJ taxes, expenses and the importance of CPAs (certified public accountants) soon. In an ideal world, we could work and have no bills and get credits to have a fun day or eat something tasty every now and then. Everyone would get what their work is worth, nobody would need to be greedy (how many key lime pie donuts can one person eat anyway? ), and life would be cool. Unfortunately, life isn't ideal, so we must exchange currency. Money is the filthy, nasty stuff we are all required to acquire to pay other people who must acquire it to pay it to etc., etc., etc. It's important not to forget about paying for and being paid for photography. Unlike commercial photographers, PJs aren't income driven. However, we must realize we're not going to survive (much less pay for supplies and equipment) by giving photos away. New PJs may be tempted to “shoot for ink” (do assignments for only a photo credit and maybe a film reimbursement). DON’T DO THIS! It hurts everyone in the industry. If PJs (professionals and amateurs) don't charge appropriately for their work, they'll drive down the market price and make it impossible for anyone to make a living. Capitalism in its purest form states a product or service is only worth what someone is willing to pay for it. If it's worth nothing, then it's “worthless.” Images are definitely not worthless. Those who think images are worthless, aren't worthy of the images. I'm as guilty as others for undervaluing my own work. According to the NPPA Cost of Doing Business Calculator, I should charge a minimum of $889 per freelance assignment to cover expenses. For a three-hour shoot, my fee is about correct. However I don't really cover expenses with a two hour shoot (my minimum). I must move beyond feeling that money is the root of all evil. It's simply credit for work done – professionally. It would be ridiculous to negotiate with mechanics to purchase parts and fix my truck for free. They won't accept “I'll give you credit” as payment. The same holds true for dentists, doctors or any other professional. Yes, there are trade-out agreements in the professional world, but they are fair trade outs and carry value for all parties involved. Lewisville's Krystine Cethoute (No. 10, left) and Lauren Post (No. 3, right) go up to stop a hit from Flower Mound Marcus' Amanda Keithley (No. 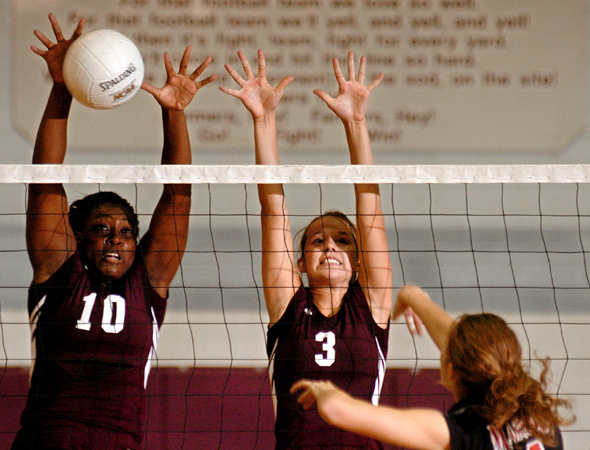 4, right) during a volleyball game at Lewisville High School in Lewisville on Tuesday, September 14, 2004. Marcus won the match. Guadalupe Pena with Lloyd D. Nabors Demolition Inc. of Dallas dismantles the College Street Pool in Lewisville on Tuesday, September 14, 2004. 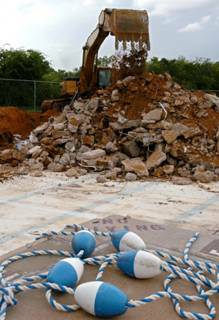 The city plans to completely renovate the park once the pool is removed. If anyone wondered why I carry a hard hat in my truck, here's why. PJs can't get this shot without a hard hat because the people operating heavy machinery don't want responsibility for the PJ's safety. They want to do their job. The PJ also wants them to do their job. So spend the $7.50 and get a comfortable hart hat. I wanted to thank Rannie Turingan (of photojunkie.ca fame) for writing a nice blog entry about this site at photoblogs. As a result, this blog got a record number of hits today. The Guardian reports Ghaith, an Iraqi PJ and former blogger, was injured in the most recent fighting in Iraq. Both Fayrouz and I wish him a speedy recovery. Even if PJs aren't covering hurricanes or sports, they still need to know how to deal with rain and wet conditions. Most PJs shoot weather features for record (it rained today) or filler (the expected parade was cancelled, but the hole remains). If not, they'll cover breaking news in the same conditions. This means their camera system (presumably $5,000 or more) is exposed to these conditions. When it's raining or the PJ covers water-related events, take a minimalist approach and only risk one camera and normally only one or two lenses (if possible). If the first camera fries, at least there's one more working until the first one comes back from the shop. But, let's consider how to stop it from frying in the first place. Probably the safest plan is to use an underwater camera with a dual-purpose lens (some lenses only focus properly underwater). Although this is probably the best alternative for extreme cases (hurricanes, floods, mud-bogging competitions), it can still be used for general assignment work around the city in a pinch. The only problem is film changes. Likewise, there are underwater cases for many popular cameras. No, we can't use the 400mm. But in 100 MPH winds, it isn't much use anyway. Since many pros have point-and-shoot cameras for weekend vacations, birthdays and such (sorry to disappoint everyone), an underwater case is a good investment. The desk would rather have something from a staffer or freelancer using a point-and-shoot than a big hole on the page. However, most situations won't get this bad. If necessary, use a single-use (disposable) aqua camera. It may bring back a hurricane image when it would've been impossible to get any image otherwise. Although it isn't much of an advantage, at least the film is sealed throughout the process. Even though it's not a pleasant thought, NBC (nuclear, biological and chemical) warfare is a reality on this planet. Underwater cameras can be decontaminated when standard cameras can't. Additionally, most underwater cameras still have manual shutters, film advances and meter overrides. If there's an electromagnetic pulse, they still work. Again it boils down to something versus nothing. Several companies make really nice covers for camera systems. I think Aquatech's cover is probably best for pro PJs on the coasts and serious sports shooters, but they're expensive. I'd get one, but price is an issue. Some covers provide "optical-quality" forward lens covers (filters) with their capes and covers at reasonable prices. However remember the lens system is only as good as the weakest link. Cheap glass leads to cheap images. Water resistant materials used are important for different reasons. Some water-resistant, lightweight and flexible materials were introduced in recent years. They aren't watertight, but they'll keep most rain off the camera. Neoprene covers (divers' wet suit material) give cameras extra protection from minor impacts, but also give PJs a little more trouble with focusing and are much more bulky to carry and store. Clear vinyl is lightweight and has excellent water resistant qualities. However, it isn't very flexible for storage. It also tends to be clingy make the PJs' hands hot with extended use. My personal gear is protected by a Pelican rain jacket. It also doubles as a minor blimp (sound dampener). It mounts and dismounts from the camera quickly and is water repellant. The arm sleeve and main pocket allow plenty of room for my hand to opertate the camera controls. I dislike the eyepiece window and can't understand why they chose to place the preview window on the top instead of the back. Otherwise, I'm happy with the value for the cost. It's saved my cameras from hurricanes and saltwater assignments. - Doesn't obstruct the PJs view through the eyepiece or lens. - Protects from splashes in multiple directions. - Allows the camera to be operated from inside and outside the cover. - Allows lenses to be manually focused (AF lenses sometime decide not to work). - Cover and sleeve(s) are useful or can be adjusted for various length lenses. - Allows access to change camera settings and film without allowing water to enter. - Allows PJ to see control LCD and preview window (digital). - Has a way to mount on a monopod or tripod. - Doesn't fog up under humid conditions (some manufacturers don't always think this one through). - Can be easily attached and removed. - Is lightweight, flexible and easily stored. - Has a way to attach a flash and/or flash cover. - Has an extra lens shade/shield. - Has windguards and anchor straps. For most PJs on a budget, plastic bags are the best bet. It's free. I've used this method for years and have never had serious water damage. For normal lenses (wide to 200mm), use a plastic grocery bag. For larger lenses, use a tall kitchen trash bag (black is best to minimize reflections). In a dry environment, remove the camera eyepiece and lens shade. Put the camera inside the bag. Gently fit the eyepiece over the outside of the bag to the threaded mount. All the PJ wants is an exact impression of the size. Don't screw it all the way on. Attach a rubber band over the front of the lens and stretch the bag tight. Gently mark the front of the lens by attaching the lens shade or using a UV filter. Remove the eyepiece and filter or shade and rubber band. Remove camera from bag. Use a scissors to cut the exact front and rear holes as measured. Place camera back into the bag and line up the holes. Reattach the eyepiece on the outside of the bag to the camera on the inside of the bag. Reattach the rubber band over the lens with the hole aligned to the lens. Reattach the lens shade or filter. This method allows the PJ to see completely through the camera and lens. It isn't waterproof, but it resists most rain. If PJs must directly handle the camera, reach under the bag. If not, attach the camera to a monopod or tripod and tie the handles together. Most camera functions can be operated through the thin plastic. An additional slit can be cut on top to allow a synch cord or flash hotshoe. Wrap the flash with another bag and tie the handles together at the base. Stretch the plastic over the flash head. Hold it in place with a rubber band. Cut a hole for the light to escape or use white plastic as a diffuser. Keep a chamois inside a zippered sandwich bag. Tuck it under a coat/photo vest/shirt. When the lens or eyepiece gets soaked, gently remove the water with the dry chamois in circular motions from the outside to the inside of the lens. Most grocery stores and auto parts shops sell chamois cloths along with car cleaning supplies. It's actually a piece of extremely soft, flexible, non-abrasive and absorbent leather. There are synthetic chamois cloths, but they don't work as well. Cut it into smaller pieces and keep a spare piece in a camera bag or photo vest to wipe dust/rain/mud/blood off lenses as well since they don't damage the lens and will trap dust between the fibers. Waterproof Pelican Cases are highly recommended. They're critical for any harsh conditions. They're particularly useful in bad weather, water-based assignments and desert environments. The military-grade, durable cases completely seal and keep the water and dust away from equipment and protect the contents from damage until it's time to use them. Again, these are useful in NBC environments and the exterior can be decontaminated without damaging the contents. They also have a custom interior padding system. The foam is pre-cut into half-inch cubes. PJs can arrange items on the foam, trace out the items and pluck the foam out by hand. The case interior can be customized in 15 minutes. An additional bonus of the case is how professional the PJ looks to freelance clients. I think it lets the client know the equipment is expensive and worthy of the additional protection (as well as the additional cost of hiring a pro PJ). Even if the PJ has a mid-range camera, equipment or stobes it looks impressive in a nice case. I have two types of rain jackets (warm and cold weather) and a pair of rain pants. I should get some firefighter boots, but I can't see myself using them. In colder parts of the world, I'm sure waterproof boots are vital. As a suggestion, get a matching rain suit (jacket and pants) before it rains. I got my last set (the pants wear out faster than jeans) on a rainy day and got stuck with neon-yellow clown pants. I probably should upgrade mine soon or paint on a smile. Again, I'll suggest a boonie cap to keep the rain off PJ's necks and eyepieces. I've seen other sports shooters use creative engineering to mount large (golf style) umbrellas onto their monopods. It keeps the PJ and the equipment dry in minor storm conditions. The additional advantage is protection from the sun (and stray light on lenses) in blazing hot stadiums. Although it's a cool idea, I can see how one strong gust of wind or slanting rain/sleet/snow will render it useless. The additional problem is the potential hazard of the umbrella flying onto the playing field (make sure this can never happen). I hadn't thought about using a ground tarp until I was researching for this entry. I think it would work more as a rain collector during a storm, but I could see how it would be useful for location portrait PJs to keep the subject dry. When standing on really soggy/muddy ground, I've found round garbage can lids flipped upside down (like a bowl) work great. 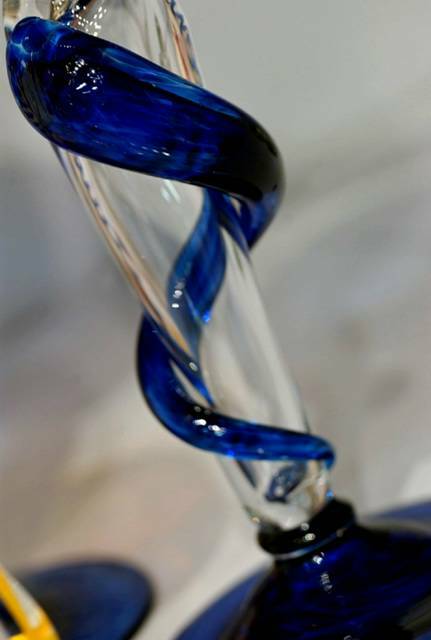 Lights reflect on the stem of a chalice designed at Vetro Art Glass studio in Grapevine on Thursday, September 4, 2003. The studio's owners created 17 custom chalices to be auctioned at Grapevine's 17th annual Grapefest. For those who don't know, Grapefest is happening this weekend. It is the largest wine-related thingy-doodle in the Southwest and ranked in the Top 100 festivals of Canada and the United States. Twenty-eight Texas wineries submit 121 wines for your vote. The winners receive the prestigious People's Choice Award. You receive a souvenir wine glass to commemorate your participation. Reservations recommended. Tickets go fast for this fun-filled event. $15 per person. After carefully selecting which wines are the champion in each of the multiple categories, take a ride on the Tarantula train to sober up or at least bring along someone who prefers to eat rather than drink so everyone gets home safe and happy. 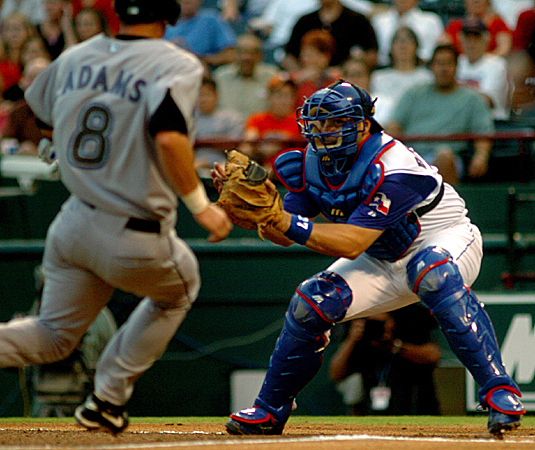 Rangers' Rod Barajas (No. 27, right) braces for impact at home plate as Toronto's Russ Adams (No. 8, left) slides into the out at Ameriquest Field in Arlington on Friday, September 10, 2004. The Rangers won the game. Potbellied pigs wait to move across a parking lot to a new facility at the City of Richardson Animal Shelter. 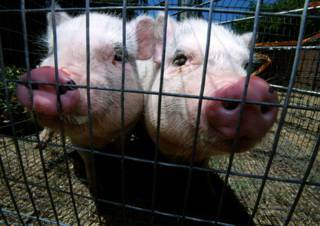 The pigs are not for adoption because they are used for city-sponsored petting zoos. Day-workers cast shadows as they get their assignments and carpool to work locations outside the Labor Ready location off Main Street in Richardson. Labor Ready provides same-day work and pay to workers. The Richardson branch is working to increase cooperation from high tech companies as local technology layoffs increase the qualifications of its daily workforce. Critique of the day: Melissa Lyttle – Pro. Melissa Lyttle is a professional photojournalist for the South Florida Sun-Sentinel. The Fort Lauderdale, Fla. photojournalist requests a professional critique of the images in her portfolio. There is no comment section, so please e-mail the critique to her. There is no deadline. She stated, "I'm always game for a little constructive criticism. 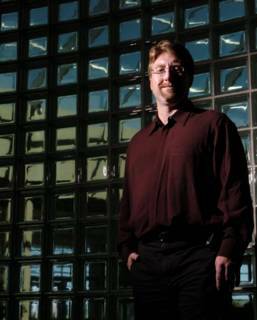 So if you need something to get the ball rolling on your critiques, feel free to rip away..."
Ray Gilliam, a programmer analyst in information services of the Dallas Housing Authority, poses for a portrait at the DHA office in Dallas on Wednesday, September 8, 2004. 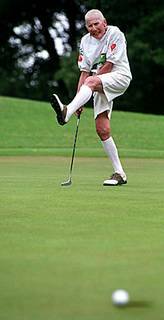 Ninety-one-year-old Grace Litterer barely misses a putt during a tournament at the Canyon Creek Country Club. Litterer plays two to three rounds each week since she retired. Litterer has also been a club member since it opened. Critique of the day: Charles Chao – Adv. Am. Charles Chao of New York City requests an advanced amateur critique of the images in his portfolio. There is no comment section, so please e-mail the critique to him. He is a semi-professional photojournalist. There is no deadline. Since a PJ is only as good as the last shot, I should change my portfolio more often. After saying this, I've recently had a few inquiries about giving critiques for newer PJs. I like to look at images and evaluate them. As anyone would, I evaluate them against images I've made and those I've seen (ie. in newspapers, magazines, online and as competition winners). A critique is a critical evaluation of a piece of work. It allows a non-involved observer to give improvement advice and ideas. The analysis can be positive (this was good) and/or negative (this needs work). In both cases, it reverts images back to images rather than an emotional incident the PJ experienced. It's an evaluation of the image itself with detached fairness. Most pro PJs ask other PJs for a "cut" when preparing submissions for competitions or a job bid. A cut is a critique of a set of images to eliminate excess. It's a non-binding edit of a set of images. The strongest and weakest images are identified and explained. Typically, the requesting PJ gives the reviewer a number to cut and a definition (contest, job, etc.). An example might be, "I need to cut 10 images for a Pictures of the Year portfolio." This lets the reviewer know to eliminate the 10 weakest images, and it also tells them the quality of the competition and the parameters of the contest. Additionally, a cut may also include an order. Portfolios and photo stories/essays require the images to be presented in a sequential order. The PJ sets the order with typically the strongest image first and the second strongest image last. The remainder of the sequence is dictated by the story and occasionally by layout (depends on format). Often, the order can determine the winner of the contest or job bid. A critique is an important tool for a PJ. It lets PJs know how their images have progressed and what they must address to become better. A good critique often hurts newer PJs' feelings. Since the point of the critique is to highlight successes and failures, the newer PJs focus on the flaws. If they learn and correct the flaws, the critique was successful. If they ignore the feedback and take the information as personal, it was unsuccessful. Either way, the responsibility remains with the PJ getting the critique. Before I give anyone's images a major critique, I explain that my comments are about the images and not the photographer particularly. It keeps me from hurting people's feelings. Please consider this as the caution. If anyone likes an image, say so. If anyone doesn't like an image, say so. In both cases explain why. It does no good to comment about an image without explaining the reason for the comment. "This is cute," is a comment about the subject matter, not about the image. "This is out of focus," is a comment about the image. "The eye is out of focus, but the ear is in focus," is an exact, constructive critique. Explain the areas of concern about a particular image: focus, exposure, timing, lens selection, lighting, composition, depth of field, shutter speed, tonal range, crop, balance, contrast/flatness, color balance, foreground/background, juxtaposition, mood, space, etc. Subject matter can also be addressed, but images should be considered as assigned and the subject matter questions should be addressed as such. For example, a portrait is a given – the subject was assigned, the background is flexible. However, a large country fair or football game gives the PJ more options on subject matter. Without a constructive idea, a comment is simply an opinion. The PJ learns how to make better images by having flaws explained and getting information on how to make the image better. For example, a tight portrait may be shot horizontally. I might suggest it would look better as a vertical shot if it only has one or two subjects. Likewise, if background items inadvertently dissect a person's head, I might suggest it would be better to find a neutral area in the background to place the person's head. In photojournalism the cutline is an important part of the image. With very few exceptions, cutlines are displayed with the image. This is the PJ's opportunity to explain why the image was created in the first place. The question posed to all PJs is "who cares?" The answer should be found in the cutline. The answer should evoke "you care because..." (without saying these specific words). Although the cutline helps explain the image, it shouldn't simply be a reiteration of the image. I've discussed cutlines several times, so it should be understood. I like images of people and/or animals. Personally, I think PJ work is about the struggles and accomplishments of living creatures (mostly humans). If the image has no people, there should be a darn good reason in my opinion. There are some truly beautiful news photographs without people, but they also tell stories of their own (often weather or seasonally related). Similarly, different PJs have different opinions about light, mood, crops, and almost every other aspect of photography. However, these are often issues of opinion and/or subject matter rather than image quality. So, I must clarify at least once during my critique if I take issue with a consistent lack of an element. The PJ being critiqued must know how this comment about subject matter relates to the overall image (and future images). The defense of a piece is equally important as the critique. It's a rebuttal of the critic's comment. Often a defense is simply, "OK." However, sometimes the PJ may need to explain the reason for the photographic decisions made. During a cut, the PJ is defending why an image should not be cut. Since the PJ is the final arbiter of a cut, they're often required to face their own emotional attachments to images during the cut. If the image can't be defended, cut it. Yes, the subject blurs, but it shows the action of the shark ripping his leg off. The subject may initially look out of focus, but it was dead for several days and catchlights don't appear on dry eyes. The red dot is important because it represents the Japanese flag. It's the reason this fish costs thousands of dollars more than the other fish. I chose this angle because I didn't have a helicopter in my camera bag. (OK, maybe this is a little too defensive, but we all get the point). A critique isn't meant to hurt anyone's feelings. It's about improving images. If PJs only seek feedback from friendly sources (family members), the advance toward a desired goal is much slower. In college, the critiques in our Environmental Portraiture class were heated. Often voices would be raised over differences of opinion. Most of those students now shoot for national magazines, large newspapers and multi-national corporations. Our critiques were passionate because we were all passionate about the medium of photography. If nobody had anything to say – good or bad – about a set of images, the shoot was basically considered a failure and not worthy of a comment. Although a portfolio critique is useful, a raw take critique is best. Trust me, a frame-by-frame edit of a raw take by someone with four Pulitzers is NOT fun. But, it's an excellent learning experience and makes better images very quickly. If you haven't had a real critique, then I'm probably not the right person as a starter. I'd suggest considering the NPPA critique program first. They hook PJs together for cooperative relationships. It may still sting, but they're probably less blunt. Another way to get critiques is to start your own (free) blog and list with PhotoBlogs.com. Then, PJs can get immediate feedback via a comment section from potential readers of newspapers and magazines. It's also a way to let others learn from the PJ's successes and difficulties. It'll also motivate PJs to find new images and display how they're improving. If a PJ wants a critique or cut, send me an e-mail with a Web site or blog and a level of critique desired (advanced amateur, pro) as well as a deadline. I'll list the site as a separate "Critique of the day" entry with a link and e-mail address (for sites without comments sections). Please title the e-mail "critique of the day" so I can handle it properly. Pro critique requests get to jump to the front of the line. If you have an online resume, please send me a link. It would be the easiest way for other pros to evaluate your experience level before they start ripping your work apart their critique. If it's not in English and you have a preferred translation program, please let me know the Web site for the translator. Otherwise, I'll use Google. If you don't have an online resume, I'll need your full name (credit line name). I also need to know your primary source of income (magazine, newspaper or freelance). If you're staff, please list the publication, city and state as well as a Web site address for the publication. If freelance, please list a few of your clients. If you've already won any awards with the images presented, please let me know. I'd also like a short paragraph or two describing what you expect from a critique or why you want one. If you prefer, you could write a paragraph about your motivation to be a PJ (it's different for everyone). The point of the paragraphs is to convince other pros to analyze your images for a few hours and give you feedback. If I simply post links without any of the information above, meaningful critiques are unlikely. This site is visited by many outstanding PJs from around the globe. I hope they'll share their views with newer PJs who want guidance. Please limit submissions to photojournalism only. Although other branches of photography (art, commercial, wedding, etc.) are valid fields, the critiques PJs would give would not be appropriate (PJs might get very indignant at set-up commercial or wedding shots, and be under-impressed by a portfolio of "Doorknobs Across America"). 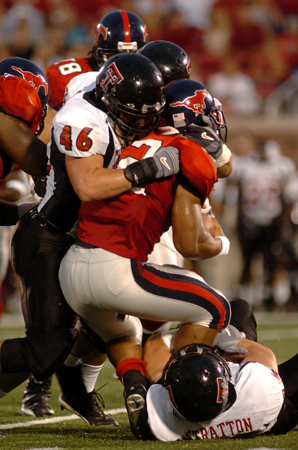 SMU's Rolando Humphrey (No. 26, left) grabs onto Texas Tech's Jarrett Hicks (No. 88, center) as SMU's Ashton Nixon (No. 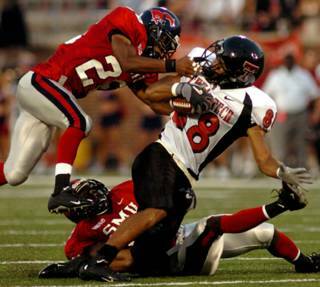 12, bottom) keeps his ankle during a football game at Gerald J. Ford Stadium at SMU on Saturday, September 4, 2004. Texas Tech won the game 27-13. It was football's opening weekend in Texas. Even though it's still too hot to breathe some days (although this year has been really nice in comparison), it's still unofficially fall here. This image made it onto the Sports cover today. I'm happy it got good play. I think this was shot with a 300mm manual focus lens from the endzone. One of the lenses I used was a 600mm (effectively 900mm) f/4 lens. It had worked OK on a monopod for the TCU v. Northwestern game on Thursday, but I put it on a tripod for this game because it's a bit too hard to handle. It's also much less crowded behind the endzone, so a tripod is OK. It takes a really bright stadium to use an f/4 lens. SMU is probably the best lit stadium I get to shoot. It has great light and the lights are located in the four corners instead of from only the sides. I used my normal 300mm and 80~200mm on the sidelines, but college football sidelines aren’t as flexible as high school football. If you posted a football image from this weekend, leave a link in the comment section. Even if you're reading this a few months down the line, leave a link to an image that was shot this same weekend. It would be interesting to compare everyone's shots from the same time. Texas Tech's Mike Smith (No. 46, left) stops SMU's Foy Munlin (No. 32,right) during a football game at Gerald J. Ford Stadium at SMU on Saturday, September 4, 2004. Texas Tech won 27-13. Carroll High School's McKay Jacobson (No. 6, left) makes a catch and touchdown as Coppell High School's Kershaw Patel (No. 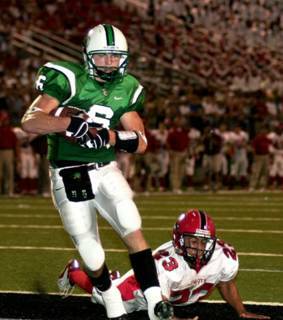 23, right) hits the turf during a football game at Dragon Stadium in Southlake on Friday, September 3, 2004. Carroll High School's Chase Daniel (No. 4, right) passes between the hands of Coppell High School's Patrick Drew (No. 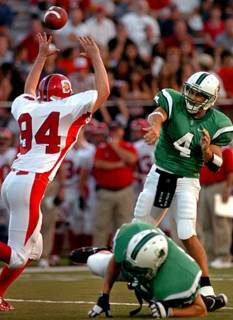 94, left) during a football game at Dragon Stadium in Southlake on Friday, September 3, 2004. 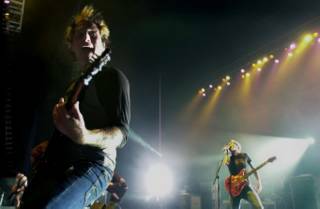 From the "when it rains it pours" category, Cindy over at Texas Gigs has also named Photojournalism as its blog of the week. Thanks! North Garland's Jaison Poole (No. 11, left) and Gary Roberts (No. 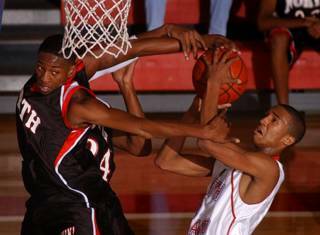 24, center prevent South Garland's Kadron Jordan (No. 5, right) from scoring during a basketball game at South Garland High School on Saturday, January 4, 2003. This is a little older photo. It won an award last year. Speaking of awards, I want to thank Y'all Blogs for awarding this blog as the Blog of the Week. I appreciate their nice comments. For anyone who is new to the site, please click on the images to see a larger, more detailed image.